Shelby In Colour: More Orange? Surely Not! Hello ... yep I'm back again ... wow 3 posts in one night! And would you believe it ... more orange! What's going on here? Maybe its the sunshine that we have been getting, I could be feeling more Summery. 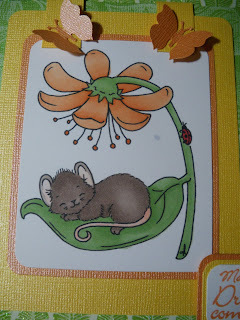 Tonight I have coloured a gorgeous little mouse from Sliekje Stamps. 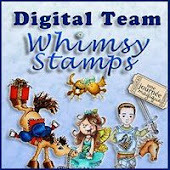 You just have to check this website out as she has gorgeous FREE stamps available. I love her little animal stamps and she has some lovely children images as well. I was just fiddling really tonight ... but I was quite happy with my colouring and thought I would make it into a card. I used a corner punch on the corners of my images and cardstock to give it a softer look. 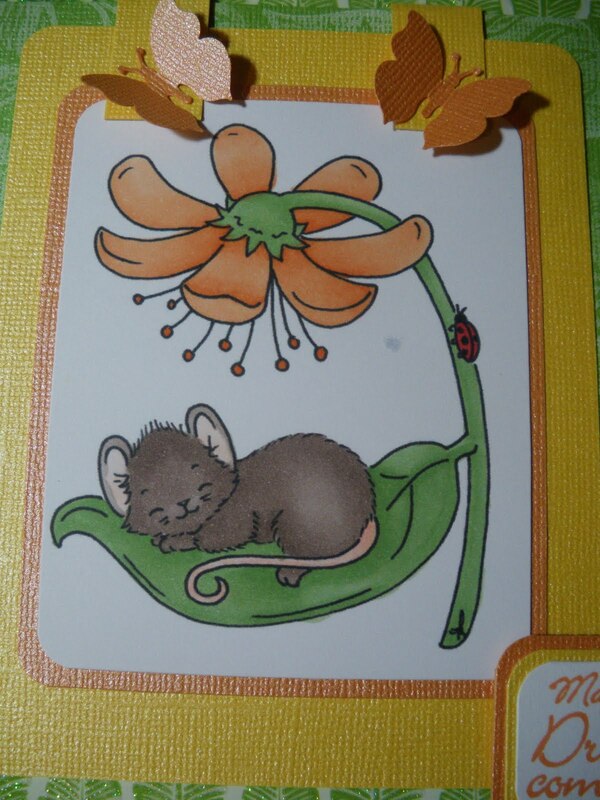 This gorgeous little mouse was giving of a soft but fresh vibe ... so I wanted the card to be bright but gentle. Does that make any sense to anyone else except me ha ha ha. I also used a punch to punch out the little butterfiles, I thought they added some dimension and a nice finishing touch. Can you believe there is no purple on this card? Neither can I! The flower was going to be purple but I made it orange at the last minute. Thanks for checking out my card ... I hope you have as much fun creating something today. It is a lot of challenges ... but I thought I would give it a go .... you should see the hundreds of cards in some of them! Ok off to bed now .. night night. I love your DP and the orange really pops but absolutely compliments that green. Gorgeous card and adorable image. Way to go! Thanks so much for sharing it with us at Make It Monday! Such a cute image, beautifully coloured and gorgeous backing papers. Thank you for joining us at Willow Sketchie this week. Fab card! Just love the backing paper that you made!! Love your card... nice color combo, one of my favorite and never fails... I saw it at MIM and it looked so sweet that I have to come and take a closer look... Fab card! Love your design paper and the cute image! Great colors! Thanks for playing with us at Paper Playtime! Thanks for playing along at Paper Playtime! So cute! I love how you colored this sweet image. really cute card, love the papers & those butterflies are perfect! OMGoodness what a cute project just love it..
Carly, this is way tooo cute, I love it! 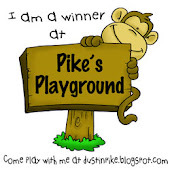 ooopsy...sneaky word verification--not visitor friendly! 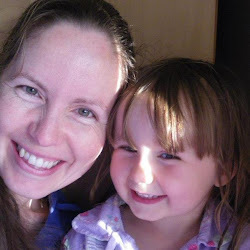 Thank you for joining us at Karen`s Doodle last week.